In The Pervert’s Guide to Cinema, directed and produced by Sophie Fiennes, Slavoj Žižek opines from a boat, mimicking a scene from Alfred Hitchcock’s The Birds (1963). He claims, counterintuitively, that the key to understanding horror films is to imagine the absence of the horror element. Putting aside the boredom of such an exercise, he provides a plot summary, describing the hero, Melanie, as falling in love with Mitch and then going to Bodega Bay only to find out that he lives with his mother Lydia. This is followed by a standard oedipal reading of the film, which addresses the supposed incestuous tension between mother and son, painting Mitch as being divided between his possessive mother and his romantic love interest. 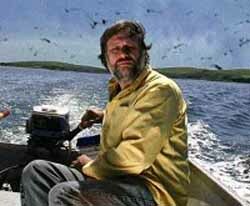 Following his description of The Birds, Žižek goes on to address what he sees as the obvious question, which is “Why do the birds attack?” He argues that the birds are akin to a foreign dimension that intrudes on the reality of the film, literally tearing it apart. The attacking birds represent the explosive outburst of maternal superego trying to prevent a sexual relationship between Mitch and Melanie. This view of The Birds is tediously echoed by Margaret Horwitz, who writes, “The wild birds function as a kind of malevolent female superego, an indirect revelation of Lydia’s character. She is a possessive mother, intent upon furthering a symbiotic, oedipal relationship with her son” (as cited in Gottlieb & Brookhouse, 2002, p. 281). Freud’s theory states that we have two modes of being when interacting with the world. One mode of being is conscious, but the other is inaccessible. This inaccessible part is referred to as our subconscious, and it is here that “a large subset of our memories, emotions, fears, impulses, thoughts, and desires” (Sandis, 2009, p.60) reside. The contents of our subconscious remain where they are due to our repression of them. Unfortunately, they can’t remain locked away forever and take a number of different paths to try and get out, such as through dreams. Freud divides the self into the id, the ego, and the superego, all of which conflict with one another. Three of Hitchcock’s films, Spellbound (1945), Psycho (1960), and Marnie (1964) seem to be explicitly influenced by psychoanalysis, though Psycho is typically viewed as the most Freudian of the three. Psycho thwarts our desires by making us first identify with Marion and her neuroses, only to be “cut off from her and subsequently unwittingly caught up in the perverse and psychotic desires of Norman and [we] are then, presumably, punished for such errant identification by a narrative that does not follow the ‘classical’ realist narrative trajectory of resolution and reassurance” (Kolker, p. 168). In this regard, Psycho can be seen as a deviant film, and Kaja Silverman, in her psychoanalytic reading, reinforces this judgment, arguing that it ruptures the “classical ‘system of suture’ whereby coherent forms of meaning and unified subject positions are upheld” (p. 168). She treats the film as an attack on the viewer by not fulfilling our desire for this suture (Silverman, 1986, p. 227). You have to remember that Psycho is a film made with quite a sense of amusement on my part. To me it’s a fun picture. The process through which we take the audience, you see, it’s rather like taking them through the haunted house at the fairground (as cited in Bordwell, 1989, p. 229). Hitchcock was fascinated by Psycho‘s popularity, but the object of his interest was the average viewer, not the delusional scholar. After being told that The New Yorker had attempted a rudimentary psychoanalytic reading of Psycho, Hitchcock, in a rare display of anger, replied “The stupid idiots! As if I don’t know what I’m doing. My technique is serious. I am consciously aware of what I am doing in all my work” (Sandis, 2009, p. 56). Hitchcock liked to present a familiar situation with seemingly ordinary people, and then reveal to us the surprising, damaged, or unclean lurking beneath the surface. You can see this in his fixation on leading ladies who are initially cool and aloof, only to reveal that there’s more going on than we initially assumed. He makes this abundantly clear in The Birds, when Melanie is revealed to be more than an archetypal hedonist as Mitch presses her on her supposedly titillating past. 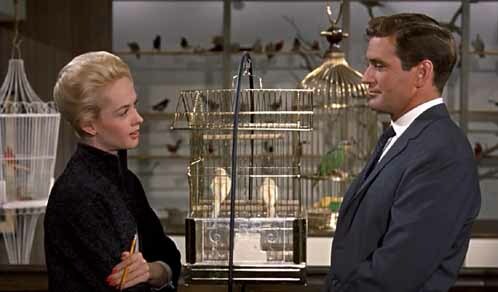 Similarly, Marnie, which, like The Birds, features Tippi Hedren as the lead, follows a thief, Marnie Edgar, who, throughout the course of the film, reveals that when she was a child there was a traumatic experience that gave rise to her adult fears. Hitchcock’s resistance to psychoanalytic probing can also be found in his films, though this is complicated by his intentional use of Freudian concepts, such as in Marnie, where the criticism is taken as evidence of repression. Robin Wood (2002) observes that The Birds also attempts to jettison a Freudian reading: Annie Hayworth, for example, shoots down the notion of a “clinging, possessive mother,” later putting the emphasis on Lydia’s fear of abandonment rather than jealousy (p. 153). This can be brushed aside by the psychoanalytic critic because it could presumably be planted by Hitchcock as a red herring. Sandis (2009) is justified in wondering if any possible evidence could count against a psychoanalytic reading. Unfortunately, regardless of where one stands on the notion of falsifiability in interpretation, it is not as relevant to this discussion as it could be because film scholars influenced by psychoanalysis, such as Žižek, do not view their readings of films like The Birds as a purely subjective exercise. They believe psychoanalytic theory to be true, at least as much as they’re willing to grant that truth and falsity are not mere constructions. While I would like to challenge psychoanalysis directly, such a giant undertaking is not possible in a piece of this length. It should be enough to admit that I view the scientific pretentions of psychoanalysis with suspicion, and even if I were empathetic to aspects of psychoanalysis as a general theory of human nature, it does not follow that it should or could be applied to film. Rather than directly attacking psychoanalysis, I will approach Žižek’s reading of The Birds through the film itself. Hitchcock introduced a term, the MacGuffin, that is usually conceived of as a plot element, sometimes an object, like a package, but it can also be something more ambiguous. In fact, it doesn’t really matter what the MacGuffin is, as long as it is important to the characters and their motivations. My suggestion is that psychoanalysis might itself be a kind of MacGuffin for Hitchcock, who didn’t take Freud’s ideas seriously but found value in them as tools, sometimes as a way to get complex ideas across to the viewer and sometimes to distract (Sandis, 2009). Sharrett sees The Birds as a turning away from psychoanalysis for Hitchcock, suggesting that it subverts attempts to use science or scientific-sounding forms of analysis to understand the birds, which are a wrathful force unleashed upon a “small-minded and hysterical community” (as cited in Gottlieb & Brookhouse, 2002, p. 364). The attacks themselves defy psychoanalytic readings, as many of the victims lie outside the supposed sexual dynamic represented by Lydia, Mitch, and Melanie. If psychoanalysis is to be used properly, it should not be separated from causation, and The Birds is an “assault on causality, a tactic not taken up in the same way in the fantastic cinema until almost a decade later” (p. 366). If The Birds is indeed simply an oedipal melodrama, the attacks should be causally connected with a “‘crisis’ in the inter-subjective relation between Lydia and Melanie” (Boucher, Glynos, & Sharpe, 2005, p. 72,) but it’s not. Over Union Square, the birds begin massing before Lydia and Mitch have met Melanie. It’s true that the birds haven’t attacked at this point in the film, but if we’re dealing with the motivations for the bird attacks, we can’t entirely separate the initial phenomenon of strange behavior from their later homicidal urges. Even if I give ground on this, the first attack also happens before Melanie and Lydia meet. This pushes the causal force onto the Melanie-Mitch relationship, which doesn’t fit with Žižek’s reading or the elaborations of other psychoanalytic critics. This is of course not sufficient to discard Žižek’s explanation entirely, but it does pose a serious problem for the psychoanalytic critic. 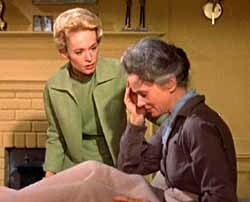 Another difficulty with the psychoanalytic reading is that the birds continue to attack after Lydia accepts Melanie. Žižek views Lydia’s acceptance as occurring at the end of the film when Melanie is in shock, but it actually occurs much earlier when Lydia is recovering from seeing a neighbor’s body (an innocent, I might add). Melanie brings her some tea and Lydia breaks down, resigned that she will be abandoned. There is no maternal wrath in this scene. This might be explained away as a manipulation by Lydia to get Melanie to go to the school where she will be attacked, but this doesn’t explain why Lydia would want to put her daughter Cathy in danger, and more importantly, a key element of the psychoanalytic reading is that Lydia isn’t active with her maternal power, i.e., it’s an emanation from the circumstances. Lydia doesn’t control the birds in any logical sense, so the idea that she was sending Melanie to her death is ludicrous. These challenges are related to the narrative, but we can also look to character for flaws in Žižek’s position. Mitch is more or less established as a cad, and if he is beholden to his mother, it is a tenuous connection indeed. Lydia’s fears of abandonment are not just tied to the death of her husband, but the fact that Mitch does what he wants when he wants. It can be argued that Mitch’s relationship with Melanie isn’t terribly important; he is clear about his motivations, which are driven by his interest in her rumored behavior, and Melanie puts her potential relationship with Mitch on hold to forge bonds with his sister Cathy and his mother, all of which are separate from the familial triangle. In Vertigo (1958), Scottie Ferguson, played by James Stewart says, “There’s an answer for everything.” McCombe (2005) argues that this is Hitchcock at his most ironic (p. 66). If we are to take up Žižek’s suggestion that we should pretend that the monstrous force is absent from The Birds, what we’re left with is not a melodrama but a screwball comedy. Melanie’s behavior is not rational: people generally do not go to her lengths to accomplish serious goals, let alone trivial ones, such as delivering lovebirds to a man that she barely knows in a location she’s not familiar with. This is, however, consistent with screwball comedies, where the characters are often impulsive and silly. This irrationality is not limited to character; The Birds defies any attempt to explain the attacks: the police officer’s explanation that lights must have attracted the birds strains credulity, and it is just as absurd that “the children must have ‘bothered’ the gulls that disrupted Cathy’s party” (McCombe, 2005, p. 68). The ornithologist simply denies that the attacks are happening, even though we know better, but the explanations don’t stop there. A hysterical woman claims that Melanie directly caused the attacks, and a drunk keeps repeating that the world is ending. This last explanation, while not satisfying, is, as McCombe argues (2005), oddly compelling because Hitchcock himself characterized the motivations for the bird attacks as having to do with human complacency (p. 71). Of course, The Birds is not screwball comedy, and there’s no need to imagine that the birds do not exist. The birds are a necessary component of the film’s world; they are not separate from its reality. The difficulty in explaining why the birds attack has nothing to do with Oedipus. The horror film has frequently been “resistant to systems of rational causality; the current horror film amplifies the disappearance of causality by debunking the conventions of the supernatural, but also by deconstructing itself as a genre” (as cited in Gottlieb & Brookhouse, 2002, p. 368). The explanations offered within the film are not there to distract the audience from the actual cause because there is no actual cause, or at the very least it’s not revealed to us. This explanation or lack of explanation may seem too easy, but it’s not necessary to embed causal explanations in the film because that is not the focus of the audience’s attention. It is the search for explanation itself and the experience of the alien, disturbing, and frightening that thrills audiences. This claim can be validated and invalidated by studying actual audiences and their behavior — the empirical evidence of spectatorship. It may not be as compelling as a psychoanalytic reading, but it avoids cinematic essentialism and has the potential to lead to new research questions. Bordwell, D. (1989). Making Meaning: Inference and Rhetoric in the Interpretation of Cinema. Cambridge, Harvard UP. Buchanan, I. (2002). “Schizoanalysis and Hitchcock: Deleuze and The Birds ” Strategies: Journal of Theory, Culture & Politics 15(1). Carroll, N. (1991). Mystifying Movies: Fads and Fallacies in Contemporary Film Theory, Columbia UP. David Bordwell, N. C., Ed. (1996). Post-Theory: Reconstructing Film Studies, University of Wisconsin Press. Geoff Boucher, J. G., Matthew Sharpe (2006). Traversing the fantasy: critical responses to Slavoj Žižek, Ashgate Publishing. Kolker, R. P., Ed. (2004). Alfred Hitchcock’s Psycho: a casebook, Oxford UP. McCombe, J. P. (2005). 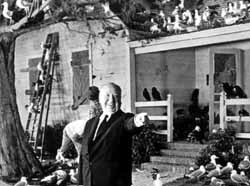 “Oh, I See. . . .: The Birds and the Culmination of Hitchcock’s Hyper-Romantic Vision.” Cinema Journal(3). Paul Ricoeur, J. B. T. (1981). Hermeneutics and the Human Sciences: Essays on Language, Action and Interpretation, Campridge UP. Rebello, S. (1998). Alfred Hitchcock and the Making of Psycho. London, St. Martin’s Griffin. Rosen, P. (1986). Narrative, apparatus, ideology: a film theory reader, Columbia University Press. Sandis, C. (2009). “Hitchcock’s Conscious Use of Freud’s Unconscious.” Europe’s Journal of Psychology(3). Schneider, S. J., Ed. (2003). Horror Film and Psychoanalysis: Freud’s Worst Nightmare, Cambridge UP. Sidney Gottlieb, C. B., Ed. (2002). Hitchcock: Selected Essays from the Hitchcock Annual. Detroit, Wayne State UP. Silverman, K. (1989). The Subject of Semiotics. New York, Oxford UP. Sterritt, D. (1993). The Films of Alfred Hitchcock, Cambridge UP. Will, D. (1986). “Science, Psychotherapy and Anti-Psychiatry.” British Journal of Psychotherapy2(2): 230-237. Wood, R. (2002). Hitchcock’s films revisited, Columbia UP. Žižek, S. (1992). Looking Awry: An Introduction to Jacques Lacan through Popular Culture, The MIT Press. Jonathan Simmons is a graduate student at the University of New Brunswick. His research concerns human flourishing and transhumanism. He is currently examining the skeptical community and its relationship with conjurers. 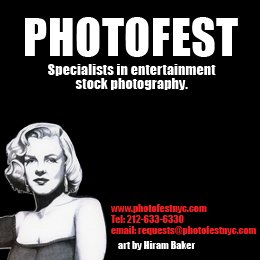 In his spare time he is a dabbling filmmaker and purveyor of unlikely miracles.